Thank you to Kasia Rabczuk from the 3DS Maastricht team for collaborating with me on this post. A short time ago an international team of students and the Maastricht Centre for Entrepreneurship came together in the Dutch city of Maastricht to begin organizing the first tech startup event of its kind in The Netherlands. Ambition ran high and time was scarce. The goal was to find a group of highly skilled and motivated participants who were willing to participate in a 60 hour experiment to start their own company. Over one hundred applicants were interviewed, but only the 44 most passionate and capable made the cut and received invites to the event. 3 Day Startup Maastricht began at BounceSpace, a newly opened collaborative co-working hub, on a beautiful Friday morning. Bouncespace is housed in a football stadium. Yes, a football stadium (note to Americans: this means soccer). I arrived in Maastricht a few days in advance to meet the local 3DS organizing team and to help prepare the site for the upcoming 3Ds event. As soon as the students showed up on Friday, I delivered the 3DS bootcamp seminar. Our bootcamp is meant to reinforce basics about lean startup-style customer discovery, to dispel common startup myths, and to help students get the most out of the intensely rewarding experience that is 3DS. The participants were then immediately split into four-person brainstorming teams. Two consultants from Amazon Web Services acted as mentors during the brainstorming process, helping the students methodically examine their startup ideas. This is a 3D printer. I can make an object of almost any shape quickly, cheaply, and often. I am going to wrap a business model around this machine. I don’t know what the business model is yet, and that is why I am here. I should disclose here that I am a mechanical engineer by training, and this machine excited my inner geek. I was fascinated with this 3D printer, and I was just as eager as the participant to discover a way to make money with it. As an aside, I believe that 3D printing technologies will become much more available to consumers and hobbyists in the long run. An analogy can be drawn between this machine and MP3s: Like MP3s, 3D printed objects promise to be faster, cheaper, and (possibly slightly) inferior copies of otherwise expensive things. The top ideas from each brainstorming team were pitched to the entire group. 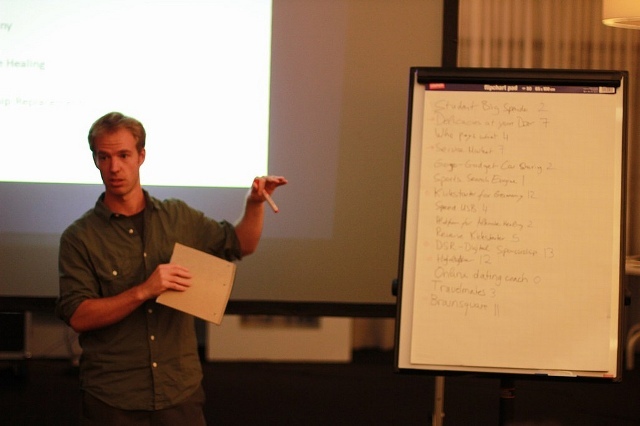 After several more heated hours of discussion, debate and voting, teams selected the most promising ideas to work on. Seven ideas survived the voting process, and we finished at the usual time: way too late on Friday night. Immediately after the vote, the students went into beast mode and worked with other team members to bang out attack plans for the weekend. Most teams worked all through the night. Some of the exhausted participants finally fell asleep as the sun came up, and I stumbled across one of them drooling on their own keyboard. 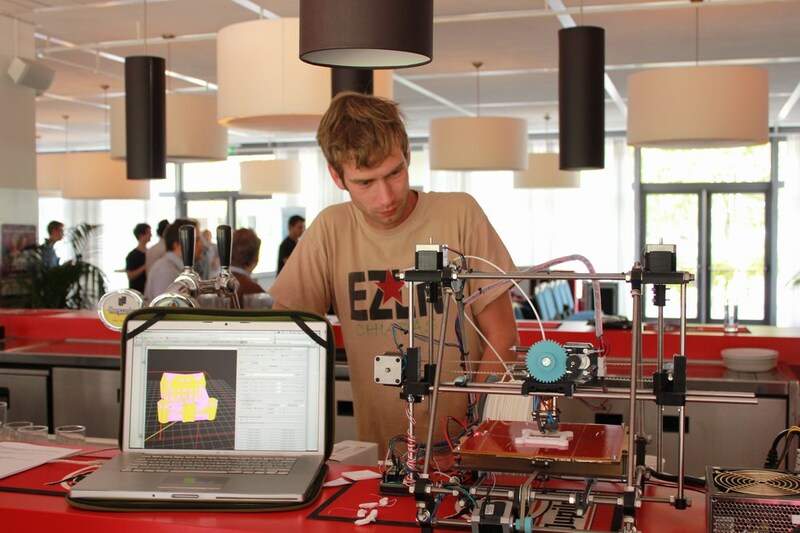 In the end, the 3D printer idea was not selected by the group. This idea was so nascent that no customers or customer pains were well understood. 3D printers are so new that potential customers might not understand the technology itself, much less the benefits it might bring. It could be the case that figuring out how to monetize a 3D printer now might be like trying to figure out how to monetize MP3s back in 1999. I ended up hooking the 3D printer guy up with another past participant who is building something like apt-get for hardware. The second day of 3DS is a time for groups to refine their ideas, gather input from experts, and get a better understanding of the market by speaking to customers. Over the course of the weekend, the Maastricht teams collected feedback from over 400 people in total. I loved seeing one team testing a hypothesis about a customer in an interesting way: they created a few hypotheses about their product/customer fit, and created a survey to prove or disprove those hypotheses. They bought a domain, built a landing page, and put up the survey. Next, they pooled their money and bought Google Adwords to funnel traffic to their site (note: your mom is not a valid test market). The entire operation took a team of three people about two hours. Their most impressive insight? People in Europe who want to participate in crowdfunding (which is mainly US based) often can’t because it usually requires a US bank account and/or credit card. This was a huge insight that the team worked hard for. I was so happy that it brought a little startup tear to my eye. 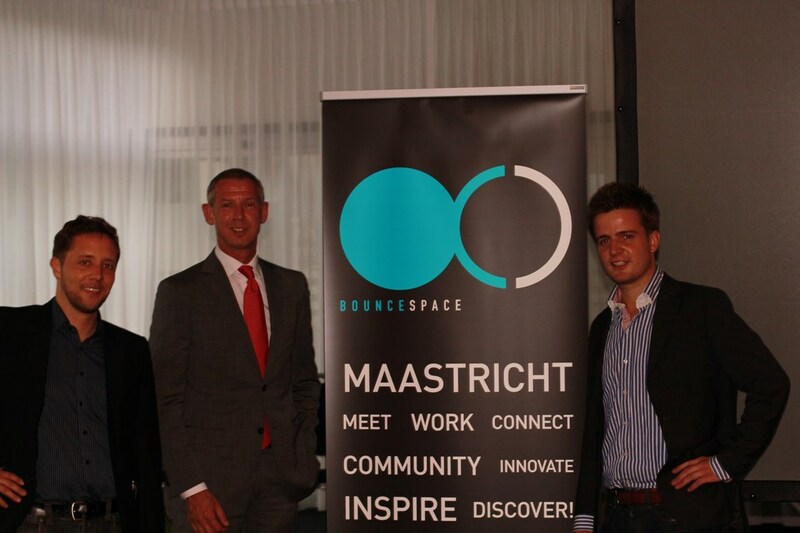 In addition to VCs and experienced entrepreneurs showing up at the weekend, the mayor of Maastricht made an appearance! Mr. Hoes spoke to the crowd and explained the city’s need for continued economic vitality and his faith in tech startups to play a key role in that growth. The final pitches were MC’d by veteran 3DS moderator Tobias Jaeger, CEO and partner at the Entrepreneur Academy. All seven groups finally got the opportunity to present their business models to the panel of investors and all of the invited guests. • Herman Hintzen, CFO and Founder HENQinvest, VC. • Floris van Alkemade, Partner Solidventures, VC. • Paul Janmaat, Coordinator NEBIB Zuid Nederland, Partner Conceptisch, Partner QBIC, Partner TomorrowToday, Consultant/Investor. • Pieter de Boer, Founder SeederdeBoer, Informal investor. Two weeks after 3DS Maastricht, I received an urgent Skype call from one of the teams. An investor wanted to meet with them, and the team had no idea how to prepare. I connected them to a law firm in the Netherlands and introduced them to a valuable, experienced mentor. Within a month of the event, I received word that four of the seven teams had arranged meetings with potential investors. This is powerful testament to the level of creativity and effort put forth by these students. Like all of the other 3DS events I have attended, there was electricity in the air. I hesitate to attempt to describe this feeling to people who have not attended a 3DS, but the feedback made it clear that participants and guests in Maastricht are hungry for more. Due to overwhelming demand, another 3 Day Startup in Maastricht is already in early planning stages. If you are interested in joining the team or following our progress, please email us at maastricht@3daystartup.org. For more pictures, please check out our Flickr and Facebook pages.